Pando: Original GitHub Octocat designer Simon Oxley on his famous creation: "I don't remember drawing it"
Original GitHub Octocat designer Simon Oxley on his famous creation: "I don't remember drawing it"
Simon Oxley is the sort of fellow who makes dry jokes so subtle that Americans will miss them. He's not a developer, techie, or household name in Silicon Valley. He's a humble British bloke with a peaceful life in his house in the Oxford countryside, with his Japanese wife and two young sons. In fact, the only thing that hints at his significance in the startup world comes in the form of a few wooden birds, spray painted black and hanging on the walls. Oxley designed the original Twitter bird in 2006 - an elegant, simple creature that decorated the early days of the site. It has since lost the spotlight to the newer cartoon version. Although Oxley is renting his house at the moment, he tells me he'll be buying a home soon with the money he made from the Twitter bird. I, gullible as they come, take this statement at face value until he laughs and tells me Twitter purchased his bird for a pittance on iStockphoto.com. Oxley made $3-$4 off it, although it did propel him to mini-graphic-design stardom. Oxley didn't discover his design fame until he was watching CNN in the living room one day. "Suddenly, an anchor was standing in front of a screen with the twitter bird really big on it," Oxley recollects. "I called my wife into the room and said, 'Look at that! CNN's got my bird!'" Oxley soon started getting calls from media outlets like Wired and the Washington Post, who did profiles on the unwitting social media designer. Twitter also used a couple Oxley iStocks for the error screens (but "not the Fail Whale!"). He says he also designed the robot with a missing arm and ice-cream chatting with a caterpillar. "He never made a big deal out if it, in his usual shrug-it-off, down to earth way," remembers Oxley's friend, Reuben Miller. "That made me even more impressed, because there is nothing more refreshing than celebrity or talent that doesn't put on airs." His bird was inspired by Japanese aesthetics, with simple, complementing angles and curves. I asked Oxley whether he deliberately made his bird look happy. He says he can't remember too well -- after all, to make his living on iStockPhoto, where he'd earn barely enough for a drink off each image, he had to produce graphics "like a sausage factory." He estimates he spent 30 minutes on the original Twitter bird. "It's not like, 'Right -- today I'm going to go draw a bird and spend a day on it!'" Oxley says smiling. 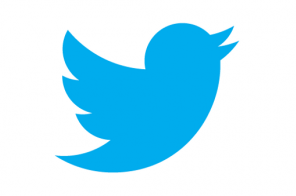 Companies can't use images they purchase on iStock for their official logo, and as Twitter grew larger they introduced the now familiar cartoonish bird, which eventually overshadowed Oxley's version. Oxley likes to joke, "That was my fifteen minutes. I used up all the minutes." However, he's not particularly bothered -- he says he'd rather be in the forest than looking at the Internet. Tim Ball, someone who has hired Oxley to design posters, likes Oxley's Twitter bird more than the new versions. "Simon's Twitter bird had a certain elegance and lightness of touch which I felt was the whole point of the brand," Ball says. On the whole Oxley's design colleagues, many of whom he met through the iStock community, hold him in high regard. They praise the simplicity of his designs, and the generosity of his spirit. Oxley himself, self-deprecating to the max, admitted he likes sending surprise gifts to his online friends, like creative wooden hangings of the Twitter design, or prints of art. Reuben Miller, who initially connected with Oxley through his design work online, says he loves the artist's unique, oddball sense of humor. "I get this package in the mail with marking from Japan, so I know it's from Simon," Miller says while telling his favorite story about Oxley. "When I open it I find this sort of beat up vinyl weird-looking nurse character/toy. No idea why he sent it. We still have it and don't quite know what to do with it." Despite that fact that Oxley is an unlikely logo poster child for the startup world, his star is not fading as fast as he believes. 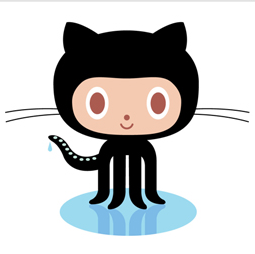 Oxley created an iconic image for another company that is growing in both fame and fortune -- the quirky GitHub Octocat. The cat-headed octopus is beloved by GitHub users who design different renditions (and animations...and time lapses) of the critter. Funnily enough, Oxley designed the octocat right around the same time as the Twitter bird, in 2006. GitHub wanted to use it for their logo, so they reached out to Oxley to bypass iStock rules and buy the rights to the Octocat directly. On Quora, GitHub co-founder PJ Hyett said, "Everybody seems to love the little guy. I'd be lying if I told you the thought of hiring someone to just do Octocat merchandising had never crossed my mind." Oxley says he doesn't clearly recollect creating the Octocat, but that he knows he used the head on another design, and copied and pasted it onto tentacles through Illustrator. "I called it the Octopuss, but the lady [from Github] kept referred to it as an Octocat" says Oxley wryly. "I was like 'Really, it's the Octopuss,' but…I think they'd already made their mind up." Just like with the Twitter bird, Oxley didn't communicate with GitHub after selling it the design. Since he didn't follow the developer world, it came as a total surprise to him when an online friend forwarded the OctoDex, the repository of all the variant Octocats Github users had designed. Oxley was delighted to see people having fun with a graphic he barely remembers creating. "Some people say, 'Why doesn't it have eight tentacles?" Simon says. "I wasn't thinking about that when I drew it, but I understand why people would be touchy about that kind of deal." His favorite variation? The Mario Brothers Octocat (designed by GitHub user Cameron McEfee). Oxley says he got into art as a child in school, when he realized it could help him skate by in other topics. "Teachers would give me merits based on illustrations I did for essays. The essays were crap though." He has a short attention span, and gravitated towards graphics in art college. After graduating, he eventually got involved in online art communities and became active on iStock. He connected with its founder - Bruce Livingstone -- who asked Oxley to design the iStock logo, a camera. In recent years, Oxley found he couldn't make a living through iStock -- too many contributors, and he says his work isn't "fashionable" anymore. Fortunately, he doesn't need to. Agencies who find out about his famous Twitter and Octocat designs contact him through his website for "proper jobs." In that way, I suppose his Twitter bird design will be paying for the home he's in the market for.